No word yet on how much the Tongan players are being paid for the Rugby World Cup campaign but their trouncing of France shows they're in the money in terms of star rugby. The darlings of the Cup thrashed France a short time ago beating them 19-14 at the Cake Tin in Wellington, causing a major upset. Based on points France still makes it to the quarter finals, but Tonga has left its mark. Fiji play Wales tomorrow but going on its performance in the last two games, fans are in for more disappointment. Information leaked to Coupfourpointfive confirm our earlier stories the Flying Fijians Rugby Cup campaign has been well supported. 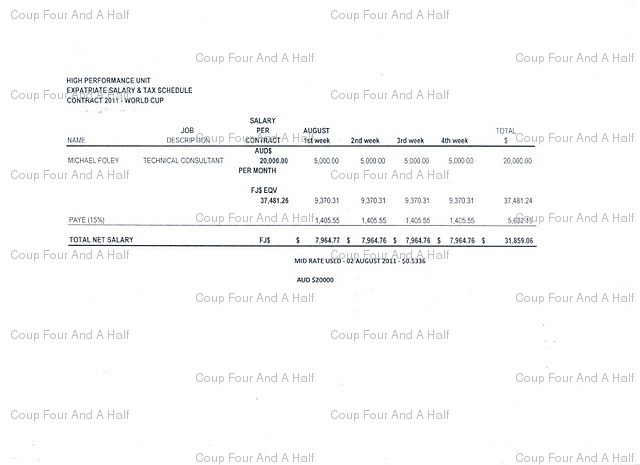 Documents sent to us show contractor Michael Foley was brought in for $20,000 Australian a month, the equivalent to $37,481 Fijian dollars, to help the Fiji team lift its performance. 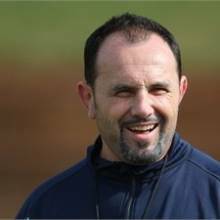 Foley was contracted as national scrum coach for the FRU for a period of four weeks for the World Cup preparations. He also qualified for Fiji travel, accommodation and meals, air fare to and from Australia including travel for family and bonuses where applicable. According to the contract sent to us, technical consultant Moese Rauluni was employed as the national skills coach for the eight weeks leading up and including the World Cup. 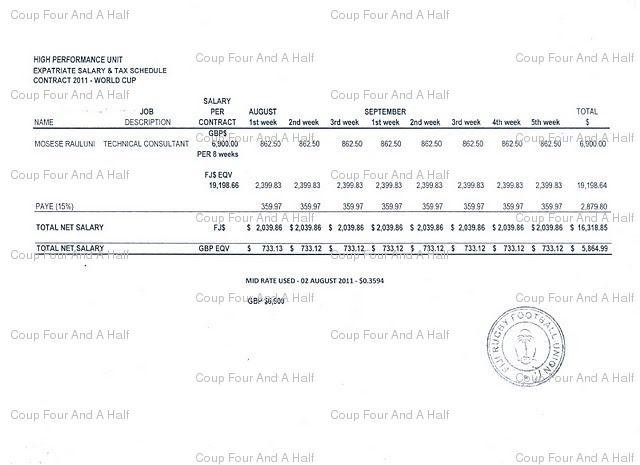 He was paid $6,900 pounds, the equivalent of FJD$19,198: FJD$ $2,399 a week. Rauluni was paid for three weeks RWC preparation in Fiji and five weeks RWC preparation in New Zealand. His contract also allowed him to get Fiji travel, accommodation, air fare to and from the UK plus one air fare for his brother-in-law "to assist Mosese's wife." 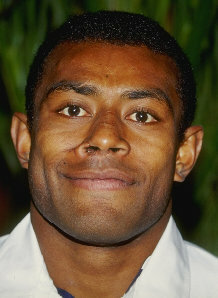 Both Rauluni and Foley's contracts were signed by Talemo Waqa on behalf of Fiji Rugby. Fiji players are being $30,000 for the tournament. They got $15,000 before the Cup and will get the rest at the end of it. Should be paid on results !!! Why would you get an an Australian scrummage coach, Aussie's can't scrum. No wonder no one is opposing Frank and Aiyaz, but at what cost to the Fijian Community now, and to their own families in the long run ? Quite interesting! So, when the interest is on money the heart is for the money not their country. It's their job so they do it for money interest only. Gone are the amateur days when the players do it for the love of rugby and their country. We need to come to term with that. Sorry Fiji. Talemo Waqa signed the deal. I thought he was the HPU Manager. Why is he all over FRU? Who is controlling? Our locally based players should have been trusted and given the $30 000 opportunity - that's going to be a very good incentive for other local players. Do not blame these people- The Fiji players are those who took the field and showed no guts and the will to fight for their country. Tonga & Samoa I salute you because your players showed pride for their country. I do not know but right now all of the people of Fiji have no guts and maybe this mentality spilled onto the players - defeated before even the first ball was kicked. Fiji needs a good coach & management team who can motivate the players but more importantly people with guts who are willing to die for the white jersey. Wales will hammer Fiji as they will be more motivated to reach the quaterfinals as the Fiji coach & players will be more motivated for only on thing - to reach Fiji quickly so that they can receive their $15,000. We've hit the nail on the head, I don't understand we focus on the players salaries and benefits. I believe we should be looking at the selection of the coaches, and the selecting panel process. Tonga played well with pride - still of opinion standout performance so far from the polynesian triangle was Samoa Springboks - just think about that final score? Big game - sellout big stage - clash of 2 classic Rugby styles - Maori get their chance NRL final - as for Viti - can't take a trick - anywhere - apparently exciting young AFL star NN who hails from Viti's Football Heartland is an Australian Aboriginal. Money well spent!! In fact, these two Rugby experts should have charged more for their services. Coaches and technical staffs DO NOT run into the field; the players do. Re-view each Fiji RWC 2011 games and it would be obvious that some players made not very wise on field decisions, detriment at crucial times when we were deem very competitive against top seeded teams. Of course we forgive them, they are human like all the rest of us. Mr. Rauluni and Mr. Foley are not magicians with a magic wand to appease some of our wishing unrealistic rugby thinking. We say, pay these two gentlemen and all players and coaching staff bonuses. In spite of our RWC results, the Fiji brand name has been propelled even further into the Global Tourism, Investment market by these fine Fiji ambassadors...well, with a bit of help from Aussie Fijian Mr. Radike Samo and the faithful Fiji supporters.. When will we stop rubbishing each other??...when?? @Semi. You say stop rubbishing each other. But you've just rubbished the players. People get paid to do a job. Its our money. If they don't do the job properly we have every right to criticize. Its people like you that keep saying that "everything is alright" is the reason why Fiji Rugby is the way it is. @Vanua, What Maori team are you talking about in NRL final????. There is no such team goofy. @ Sefanaia Suka...Sir, NO, I did NOT rubbish" our players. Pls re-read my previous post. Of course, we do not live in perfect world. The very reason people like you and I should dig deep within our own reservoir of goodwill and ..uh..live side by side for the common good.. Vinaka saka. Togan's showed true grit against all blacks when the forwards decided to head to head it. they went all out to death until they got their prize and pride. a try against the mighty all blacks. didnt see their game against france, but excellent result. does anybody know how much cash Tonga and Samoa went into the world cup with??? we can see there blood and guts on the field...how about cash? Let's thank the players for whatever effort they putin,we mght not be satisfied. They did a favour to the Samoan PM for his concern and effort to bring Fiji back to better democracy. Only by cleaning our political mess we will achieve our expectations, whether it's sport,economy or any other topics. who are all those people doing the traditional full Maori haka? Fiji is getting hammered by the Welsh 31-nil and it's only halftime! The grim scoreline (over a team we beat in the last RWC) is quite telling of the state of our national affairs that has obviously taken a toll on all free-spirited Fijians including the players on the field. Foley got 40 Moji got 20 where is the rest of the 2.5 mil gifted from IRB? I put the blame squarely on Bill Gavoka and Keni Dakuidreketi who have never played a game of rugby in their lives, in hiring Sam (Master of Accent) Domoni. The boys gave their all but it was obvious there was no structure - that is the Coach's job. And when the national anthem is sung with the words, 'land of freedom' etc my heart always breaks because this is not the situation at home anymore. I feel so sorry for rugby boys. Could the lie we sing via our national anthem be a cause for our disasterous performance on the field? Wayne Smith or Steve Hensen for Head Coach....Both have been Graham Henry's assistants since 2004 and have been contracted with the All Blacks till the end of this year, 2 months away. Get a Head Coach who will command the respect of players and officials, a Head Coach who is humble and not a boasterous wannabe big talking piece of crap like some of our locals. An overseas coach will not be bullied or intimidated by his bosses or local unions. Sack them all, First Talemo Waqa from HPU, too much talk very little development. Viti lacked the pride & passion of it 2 compratriots. when the fish head is f####d the whole fish is even more f####d....wananavu!!!! please,for the next four years give this man a chance Inoke Male as coach and Frank Boivich as advisor. look at the record.so many things to tell about this twos achievement in coaching. blame the govt of the day. tikoitoga for the forced head of fru. do not say that the deal with nakarawa is to re-apply at fmf when the rwc is over. let us see. sack the coach - he cant even apologise to the nation. Talatala Rinakama to be the national coach - he can motivate the players. look for a captain who can drive and instil pride in his team. all palyers are to be full blooded Fijian. sack all the selectors - bring in Graham Eden. call players who play for pride and not money. lets get everything in prescriptive. FRU before the current board came in was the last bastion of SDL type racial politics. The likes of Keni, Ken Zinck and Gavoka totally ran the place down as SDL did to the country in 2006. No point blaming the army for this. Even Kean said that they wanted Domini out but i guess the new board came in far too late to make that required change. Please do not allow relgion and provincialism affect this sprot of rungby.